The traditional, simplistic approach to furniture crafting is what makes the Mission style perfect for any home. 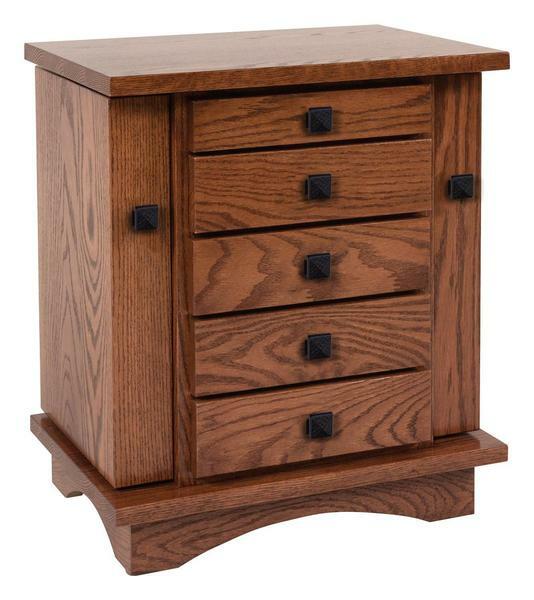 With a neat design and good use of large, flat panels that show off the grain of the hardwood, our 20" Jewelry Cabinet is perfect for any dresser or nightstand. Crafted from solid hardwood, with five velvet lined drawers and two necklace cabinets, there will be plenty of room to store your precious items and keepsakes. Each drawer offers its own unique storage space, offering a ring bar in the first drawer, a bracelet holder in the second drawer, wood divider in the third, along with a spacious plain bottom in the last two drawers. Customize one today for yourself or as a gift for someone special. Each cabinet is made to order, so you choose the hardwood and finish options that you like, combine with the perfect color velvet drawer lining and finish hardware and we'll build the perfect jewelry box, just for you.